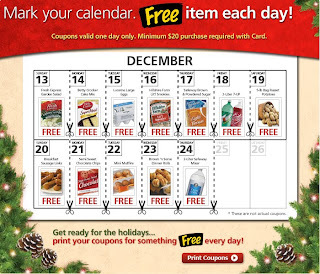 Safeway is having a free item of the day each day until Christmas! 12 days until Christmas, 12 days of free items. Now wouldn’t that have been funny if they had corresponded the number of items with the 12 Days of Christmas? Like, on the twelfth day had a free dozen eggs? These are the types of things I ponder…. Go here to print your coupons to your club card. These were also in the Sunday ad. There is a minimum purchase of $20, so plan accordingly as none of these items are worth making a special trip for, but if you are needing to do some grocery shopping anyway then these are an added bonus. Also remember, the $20 includes the regular price, not the sale price, which helps to add up to the required minimum fast. But they don't even print for me… does anyone else have that issue? What the heck am I doing wrong? I don't think you can load them to your card, they are only printables. Does anyone else have a problem loading these on their cards or printing them?